Material handling overhead crane in high and reliable quality can be supplied in our company. It is an ideal choice for the lifting and transporting of the heavy goods from here to there. The using of material handling overhead cranes is helpful to boost the productivity and achieve the rapidly economic growth. This series machines are suitable for many occasions such as the workshop, warehouse, maintenance site, assembly and disassemble site, etc. What’s more, it can be used in the construction site to lift or move the raw materials so that t is widely used in the market. According to the different designs or the cranes, it can be divided into many types.Generally speaking, our products can be divided into material handing single girder overhead crane and double girder material handing overhead crane. The detailed information is shown in the following part. 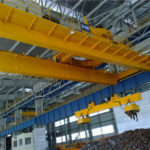 Our company is a professional and experienced material lifting overhead crane supplier in the world which has a long history. 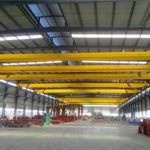 Both the single girder overhead crane and double girder overhead crane can be supplied in our company in a high quality. If you are interested in our material handling overhead cranes, please contact us at ease, you will get a reply as soon as possible. According to the number of girders, the cranes are equipped with the single girder and double girder. 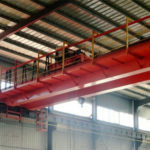 Single girder material handling overhead crane is supplied in our company and it is a kind of light duty overhead cranes. The lifting weight of this series machines is relative lower than the double girder overhead cranes. 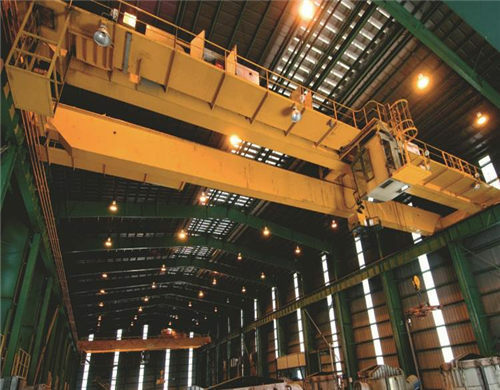 LD series overhead cranes are suitable for simple structure and low price. Double girder material handling overhead cranes are made for the heavy weights. 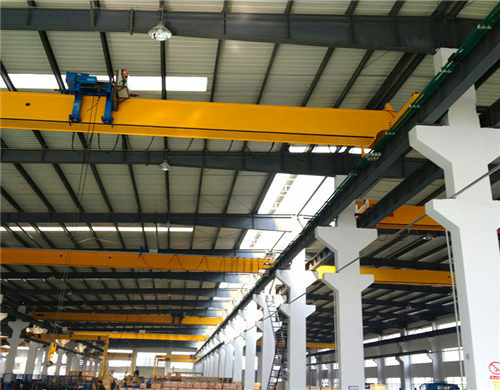 Generally speaking, material handling cranes in double girder can be seen as the heavy duty overhead crane which will improve the working efficiency and make more profit. 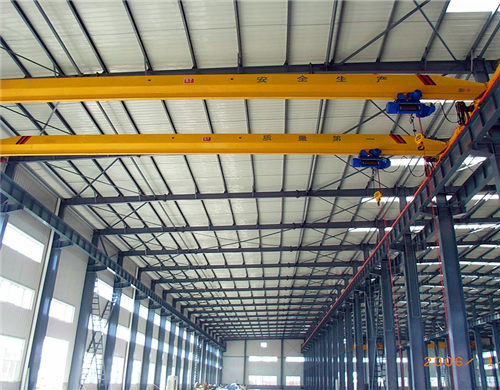 According to the different lifting styles, the cranes consist of overhead crane with hook, overhead crane with grab, overhead crane with electric hoist, etc. Overhead crane with hook can be supplied in our company which is suitable for the common sizes of the goods. The goods in the common sizes and styles can be carried or moved with a hook. QD series overhead crane in our company is able to lift the objects from 5 ton to 800 ton in order that almost all the load requirements can be met. 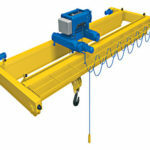 Overhead crane with a grab is designed especially for the goods which is difficult to move. For example, it can be used to grab the garage or ferruginous wastes which are scattered in the ground. They are also too heavy to lift so that the overhead crane with grab has increased the working efficiency greatly. The grab deal with the problems very well. 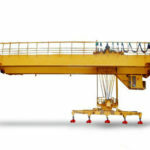 The grab crane in our company is supplied in a good quality so that it can lift the goods safely with grabs. 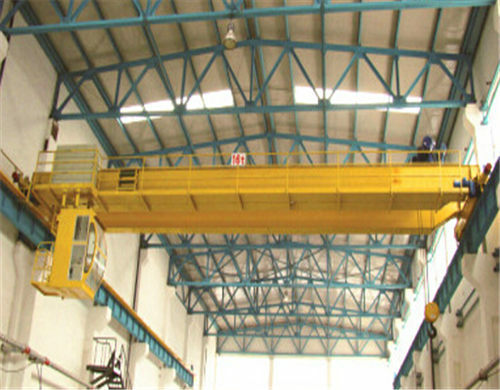 Overhead crane with electric hoist are suitable for the most lifting materials so that it is widely used in the market. 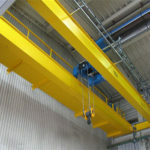 It is worth mentioning that the European standard overhead cranes are equipped with the European style wire rope hoist which owns high technology content. 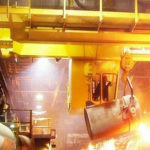 The overhead crane for material handling owns high and reliable quality. On the one hand, the machine adopts the world famous technology so that it has high technology content. On the other hand, we have professional engineers and skilled workers who are devoted to the innovation of the machine. The machine has compact structure so that it is easy to operate. Our machine is equipped with a number of safety device such as the overload protective device and emergent stop device. All in all, it is safe to operate and maintenance. Environmental friendly with low noise and energy consumption. The machine are designed and tested for the low noise and energy consumption so that it can save the cost on the energy. The low noise of the machine is helpful for the good working environment. In the meanwhile, the low noise will prove that the quality of the machine is pretty good. Perfect service including on sale service and after sale service. Excellent service can be provided in our company so that customers can get a reply no matter when and where they encounter about our products. 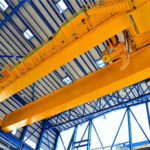 What Should You Know About Lifting Cranes? Please don’t carry anything in your hands when the ladders go up and down. If the items are too large to go into pockets or belts, they should be lowered or carried from the crane by rope. Please don’t operate the crane if you find that the limit switch is out of order or the cables are in bad conditions. Please stop lifting if the goods are beyond the rated load capacity of a crane or slings. It is forbidden that one rides on a load or hooks. Please don’t pass a load over workers and walk on the crane runway. Please keep the loads in a proper height avoiding the over high positioning. 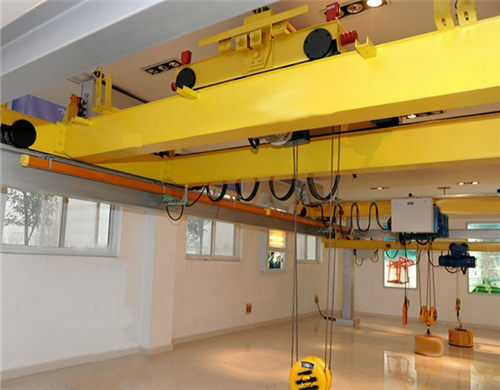 Weihua Group is one of the most important overhead crane suppliers in the world. We are located in the central part of China where the center base of machinery equipment is so that our machine develops well. Our company had a long history and our products have been delivered into many countries all over the world. With the development of our group, our company received good reputations in the world so that we have received a number of orders from customers who have bought our machine before. All in all, we have the strength and power to supply the good quality material handling overhead cranes. If you are interested in our machines, please send an email to us with no hesitation. All of our skilled workers are waiting for you all the time. Just act on it! Welcome to send an email to us!